There's something empowering about having dreams come true. In 2011, several of mine did. Some of it was luck (I bribed leprechauns to make the NY Times thing happen), some of it was hard work (editing kicks my tail). Some of it was magical (hello new friends! ), some of it was shocking (book tour?! me?! 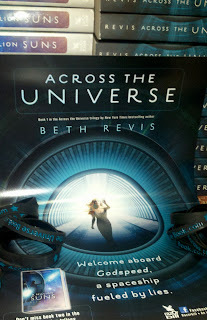 ), and much of it was tiring (see: editing, book tour), but there's not a single moment that I regret. I cannot put into words how amazing 2011 was. It just was. And now it's nearly 2012. I'm really not much of one for resolutions. I've made too many impossible resolutions before. 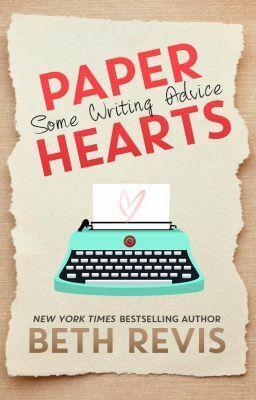 There were many years where my resolution was "get my book published," but, failing self-publication, that's not something you can completely control. When other people are involved in making a dream come true, some of it is out of your hands. So instead of resolutions, I have goals and dreams. My goals are things that I can do. My dreams are things that I can only somewhat control. It's not stuff like "win the lottery!" It's more like stuff that I can work towards, but without a little luck or help from others, it won't happen. I have three goals and three dreams. One of each is very personal. One goal will require work, but will definitely happen (unless my hands fall off). One goal is incredibly boring. One will be very, very, very hard. But it's a goal, not a dream, so I can do it. One dream is one I think will very likely happen. One dream is one I think might never. So...how about you? What are your goals and dreams? May they both come true in the new year! Thank you all for entering my contest, spreading the word, and cheering me on. 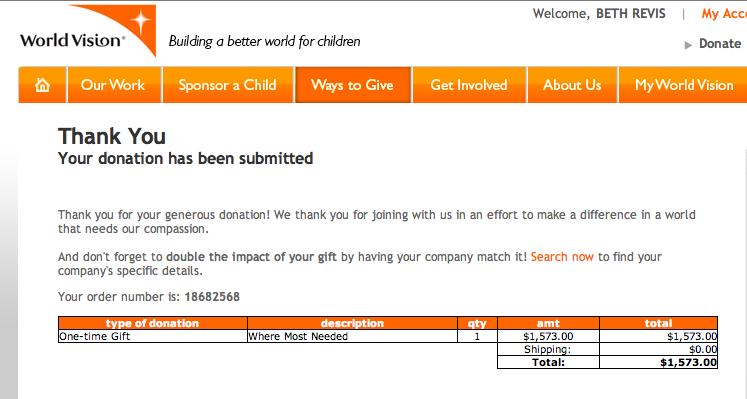 Thanks to you guys, we've raised $1,573 for World Vision. And guys? That's pretty darn awesome, in my opinion. But I know the question on most of your minds is: WHAT ABOUT THE GIVEAWAY?! Well, as you know, there were 1,573 entries. And up there above is 200 prizes. With the addresses all carefully hidden from view. 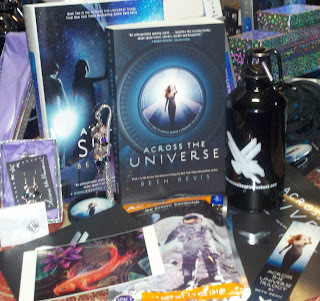 The point of the giveaway is to be a surprise--so if you win, it'll show up in your mailbox (for US residents, probably by the end of next week--international might have to wait a bit). Here are some statistics for your viewing pleasure! By pure chance, the very first person who entered won one of the big prizes. The state with the most entries was... Texas! Washington, Virginia, and California were after that. The city with the most entries was... Portland, Oregon! The international country with the most entries was... Canada! One of the winners was a former student at the high school I worked at, and although she wasn't in my classroom, one of her besties was, so I got to know her, too. I think she'll be surprised! My husband still doesn't know how much it cost to mail these out. Let's keep it our little secret, k? 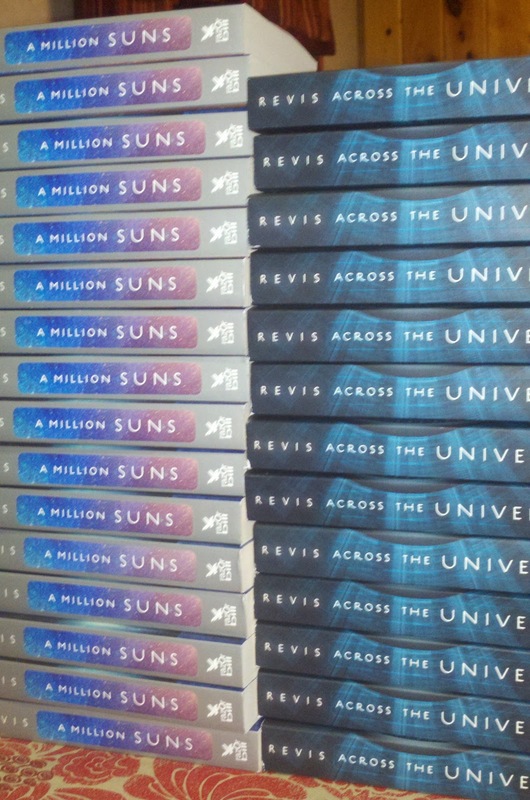 A MILLION SUNS comes out in *eep! * less than a month! This is the second book of the trilogy, and you might have noticed that we've kept the title of the third book a sekkrit, even though we've known the title since ACROSS THE UNIVERSE sold. Wait a minute...what's all that smudged out part in the middle? 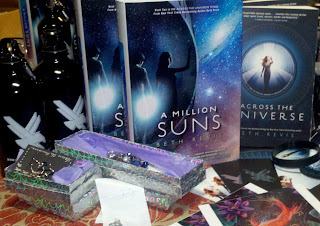 That, my friends, is where the title is, and you'll have to wait for A MILLION SUNS to be released to see it! Let me know what you think! 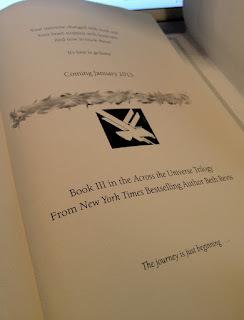 And remember for those who've read the second book: no spoilers! There are some great contests going on right now, and I wanted to be sure no one missed them. 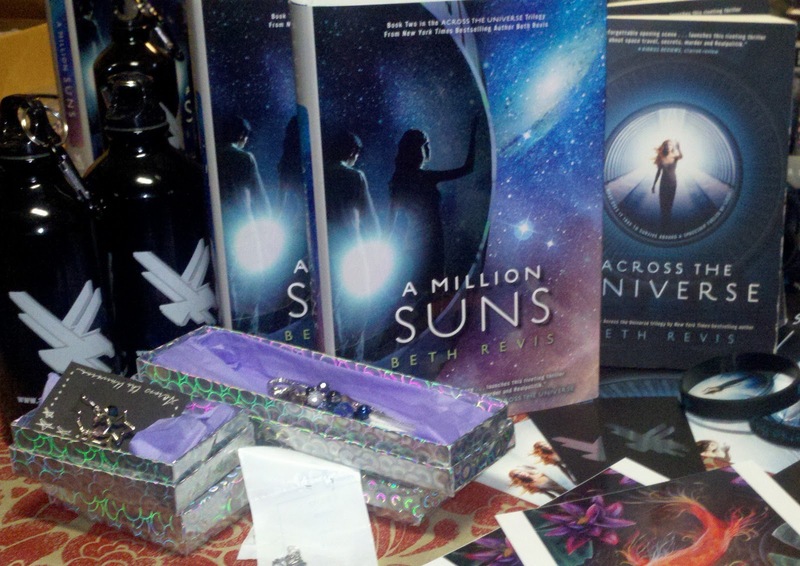 You have until Monday to enter my 200-prize giveaway! We did make the 1000 entry goal, so I will be making a donation of at least $1000 to World Vision...but barring a sudden influx of a crazy number of entries, I think it's safe to say that I'll be donating a dollar for every entry, not just the first 1000. Also: keep in mind that even though I've got about 1200 entries right now, there are 200 prizes...which means you have a one in six chance of winning something. Talk about your good odds! Speaking of good odds--make sure you enter the first year celebration over at the League. 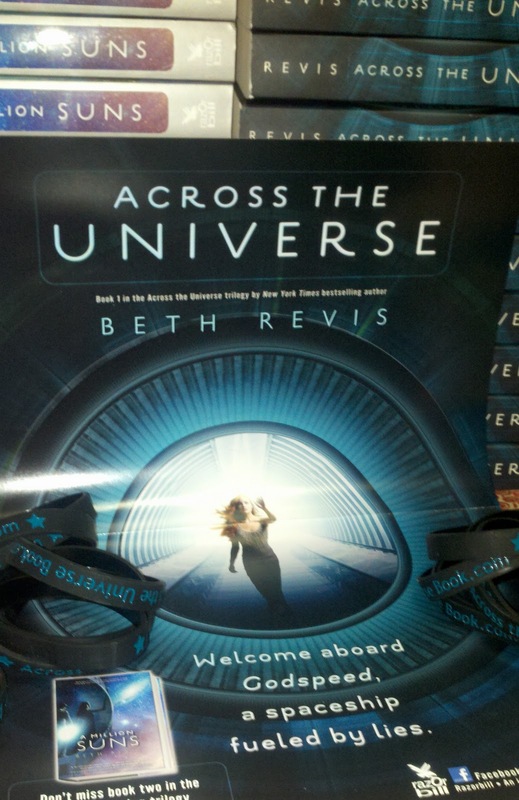 We're each giving away a signed copy of our books, so the grand prize winner will get FIVE signed books! It's super simple to enter, and did I mention the good odds you've got there? The AtU fansite, Secret of the Stars is hosting a blog hop with your choice of one of my books as a prize! Do you like puppies and kittens? Do you cry when Sarah McLachlin starts singing for the humane society on TV? 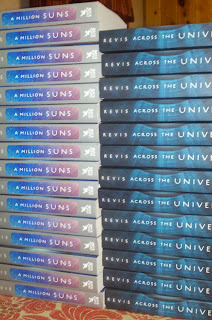 Do you also like to have signed books of some of the hottest titles in YA? Then check out this charity auction. After witnessing some animal cruelty, author Christine Johnson decided to do something about it, and launched a charity auction to support the Humane Society. 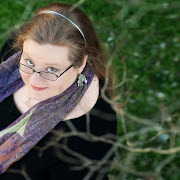 Authors Diana Peterfreund and Carrie Ryan are matching donations, up to $1000 each. It's SO EASY to help out with this auction: just go here, pick your prize, and bid. I think I've hit them all with this--feel free to post in the comments of other giveaways you'd like to share with people! 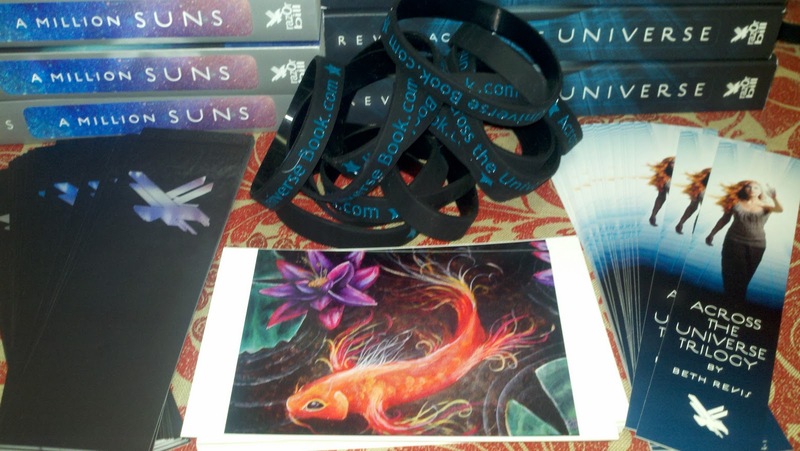 We currently have over 1000 entries in the contest! 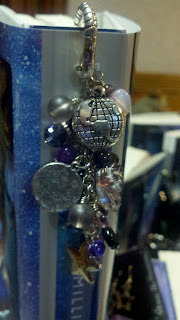 Which means, of course, that there will be at least a $1000 donation to World Vision! Epic Giveaway of Epic is Back--and Twice as Big! So last year I did a contest where I gave away 100 prizes. And this year, I got to thinking...how could I make that bigger? By giving away 200 prizes instead. And not only that, I'm going to give $1 to World Vision, an international charity that aids those in need, for every entry (up to 1,000 entries). 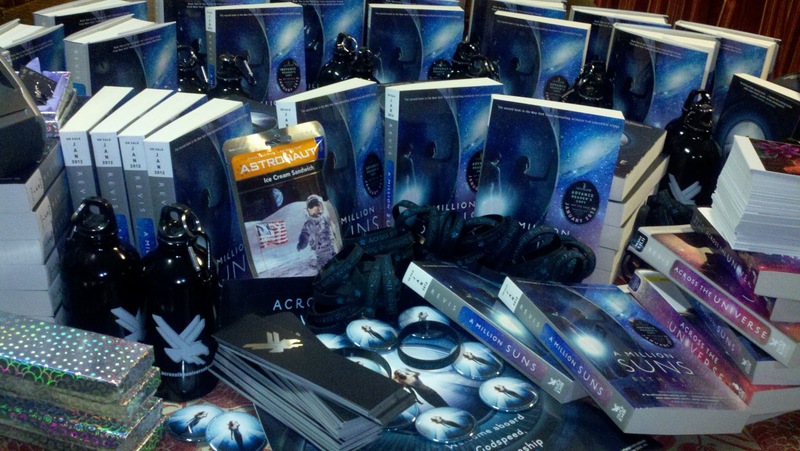 First, let me show you the kinds of prizes up for grabs. You guys. There's a kitchen table under there. Some prizes are even handmade! Remember Jennie, who made the charm bracelets earlier this year? 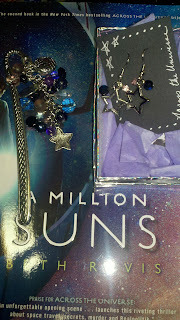 She also made some custom bookmarks and star earrings! 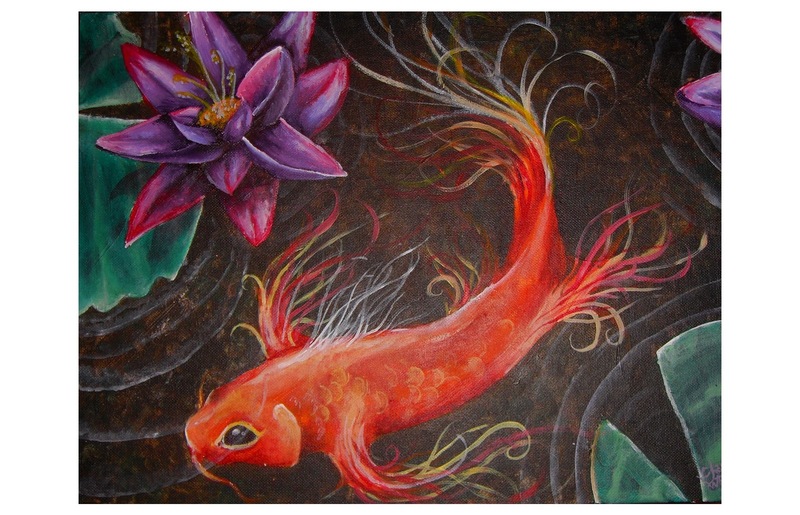 Also, some of you might recall that the character of Harley was based on a real student of mine, an artist herself who painted a koi for my classroom. 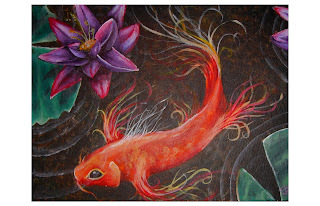 Her name is Charly White, and she agreed to help me out with my contest this year by contributing a very special painting: a koi fish by the original "Harley." I've turned her painting into a limited edition print, and will be giving away 100 numbered copies of the print to this giveaway. So, that said, let's go into a little more detail about these prizes! 30 people will win either a signed ARCs of A MILLION SUNS or a signed paperbacks of ACROSS THE UNIVERSE, plus a limited edition koi print, and swag. Look, I know it's a bit lame to say that 100 prizes will be postcards, but dude. These are some awesome postcards. 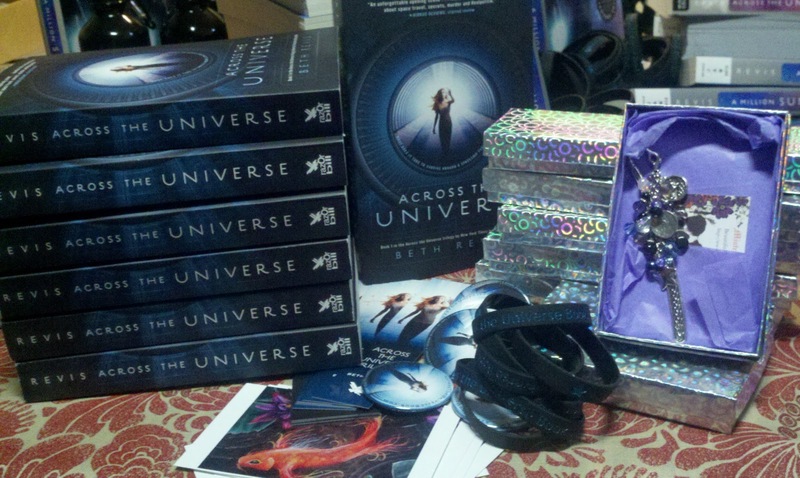 So, how do you win all this awesome? At the bottom of this post, there's a Google form. All you have to do is fill it out with your address. Then, at the end of the giveaway, I'm going to plug in all the addresses into my label maker over there, and the label maker is going to spit out addresses and I'm slapping them on the packages. And that's it. This is a giveaway, not a contest. I just want to give you guys stuff. So you don't have to do anything extra or join on Facebook or follow me or spread the word or anything (although I'd appreciate it if you did). 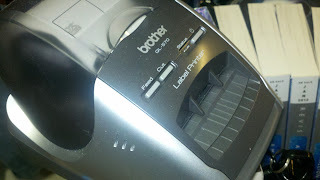 Your fate is in the hands of my label maker. However, please do spread the word. It's not a requirement, but I would really appreciate it if you did because I will be giving $1 to World Vision for every entry (up to 1,000). 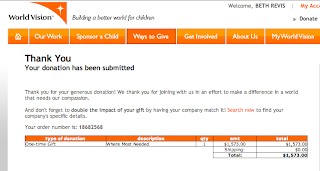 World Vision is a really worthy charity, helping families and children in both the US and across the world. 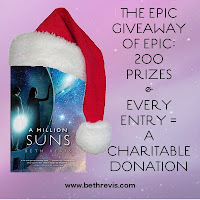 I encourage you to check the link out and think about donating yourself--but either way, I would also appreciate you telling other people about this giveaway, because the more entries I get, the more I'm adding to my annual donation to World Vision. 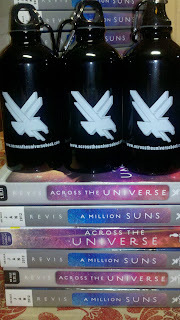 Also: thank you to my publisher, Penguin/Razorbill! 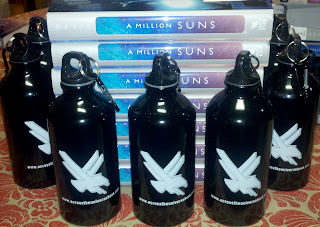 They donated a ton of the prizes above, including 20 paperbacks, all the ARCs, and the water bottles. If you want, I know they'd appreciate it if you followed on Facebook or Twitter. Again: not a requirement, just a way to thank the contributors of the prizes. Stuck in the YA Scavenger Hunt? Did you get here from Leah Bobet's page? There's a linking error--if you got here from Leah, go instead to this website to continue the hunt. If you are just starting the hunt or if you got here from Lisa Bergen's page, then read on for your next clue! On this hunt you will be able to gain access to exclusive bonus material, sign up for giveaways, and get an all access pass to top secret insider information. 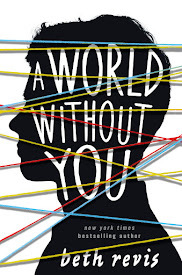 This fabulous sneak peek into what’s coming up in YA literature is for one day only! Directions: Copy and paste the puzzle at the end of this post onto a document or print it out and unscramble the words as you proceed through the Scavenger Hunt. Search for keywords, one on each website that will be highlighted in RED. When you are finished, fill out the Google form here. Rules: To be eligible for the grand prize, you must submit this filled in puzzle before noon on Dec 4th Pacific Time. All the keywords must be in the correct place and you must include your full name and address. Entries sent in without name and address will not be considered! International entries are accepted. The scavenger hunt is over! Thanks for playing! !